Offtooic, so I made a new topic. Check this: Parts Catalogs. Zip contains BrickLabels.pdf, with hundreds of small black/white images, specifically designed for use as labels, and they can be colored. Also included some other part catalogs, all things I found somewhere on the internet during the last ten year, and saved them to a harddisk. To be sure, if I remember correctly, stud.io has a wire-frame feature, so you can create a pdf with single part images shown as wire-frames. 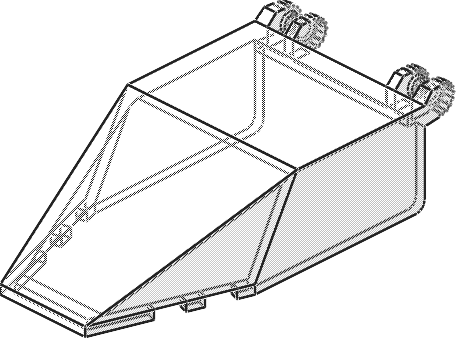 Might also checkout LeoCAD, if you use part in color white, I think the resulting printed image is a wire-frame. If you want, you can turn Always black ON too. I personally don't. You gotta experiment a bit with Thickness. It's dependent on your final image size what looks best. I generally use the 2nd notch (from the left). Curve quality: whatever you like. Since the goal here is small images, it probably doesn't need to be very high but if you're rendering single parts the processing time is probably negligible. Furthermore, the LDraw -> Blender plugin I linked a week or so ago also has a line option I believe, but not entirely sure about that. OK, I have LDView and the LDraw Library. How do I make a bulk render? I've found a .bat script, but that is incomplete (print-screens are half-screen). I never really took a look at the batch feature. I believe it's also pretty new so there might be a lack of documentation and examples. I can take a look when I get home. Alternatively, you can just create a super basic Python script that runs through all your LDraw parts and calls LDView for every part separately. Should be pretty simple, only a few lines. Ok, I made something that goes through ALL your LDraw parts and renders an image for it. The only stuff you need to change are the CAPS variables at the top. Also note that I tried multi-threading which I've never done in Python. It seems to work, but I'm not sure if it actually makes the thing go faster You can define the number of threads yourselfes. To save time, I could drop all .dat files from which I need an image (only 100 or so) from LDraw in a different folder and change to that path in this line? To save time, I could drop all .dat files from which I ne﻿ed an image (only 100 or so) from LDraw in a different folder and change to that path in this line? Toby, if you get this working, please share your experiences. I looked into LDView when trying to bulk-render RB's LDraw images, and ran into some problems. Firstly, LDView can be ran in batch, but you can't set parameters from the command line, so it always seems to use your default preferences. Secondly, and more importantly, according to the docs I read, LDView returns control *before* the image is rendered and stored. Than might mean that if you create a batch to render 1,000 images, you have a possible memory leak, as the next instance of LDView is started before the previous instance has ended. Of course, you could build in a wait for 30 seconds or so, but with 70,000 images that wouldn't work. Also, in Linux, each instance takes about 10 seconds to initialize, and that alone (for 70,000 images) was a problem for me. Guys, I think this could be interesting to regular forum users, and I could move the thread to the Help Forum. Obviously, if you want to continue privately (just us), that is OK too. Just thought I'd mention it. Ok. When it works I'm planning to post in some facebook groups as well. This question comes along often. Anyway I can credit you there? If I remove the main() at the end of the script, I get no errors, but nothing is happening. You certainly can. Not sure if you can set all options through parameters, but there's always the option to pass your own .ini file with parameters which can include any setting. 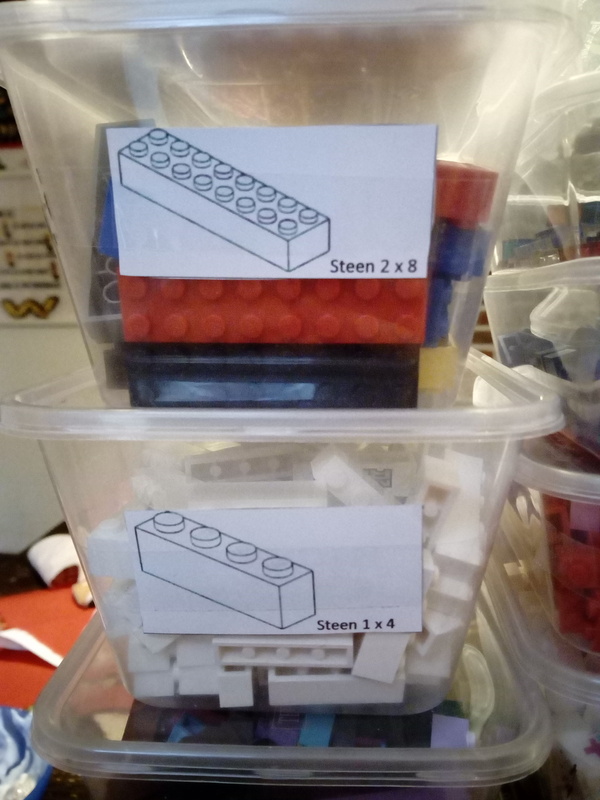 takes about 3 seconds per part (standard bricks). Is it also ok with you if I share this? Btw, if you want a little 'rounder' studs you should up the curve quality in LDView a bit. I have the program running for all 11,000+ files. 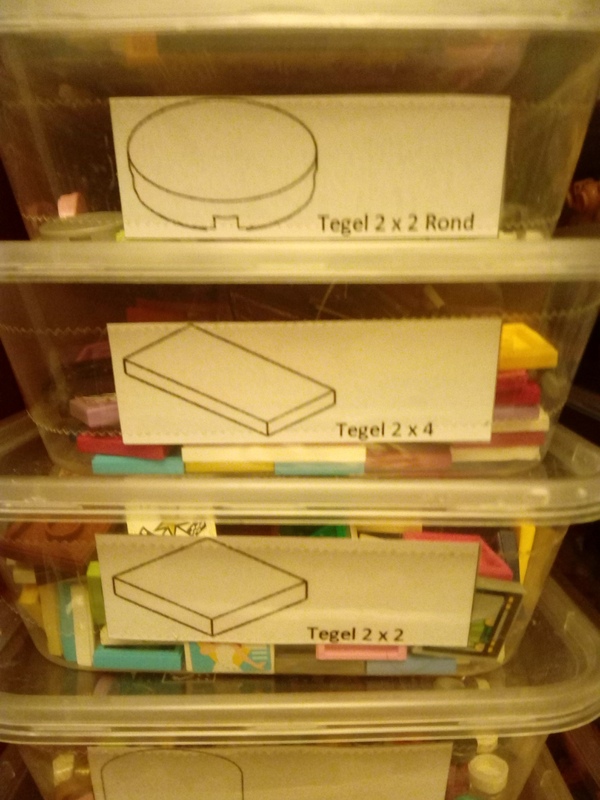 When done I'll upload them to bricksafe. I keep getting run time errors for LDView, but it still works. Nice for the casual collectors out there, personally I need mine in color. So I usually pick that right of the part page and scale it to the storage container size. 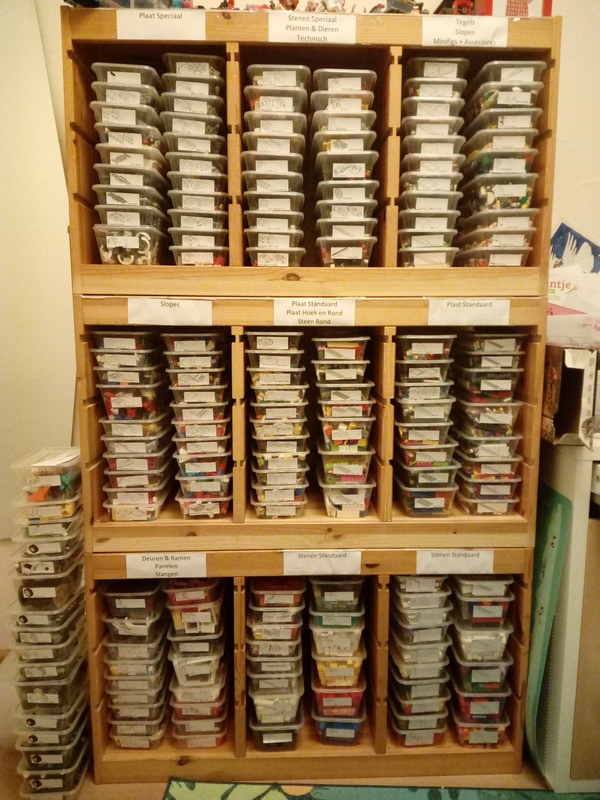 I have most parts not sorted on color, simply because I don't have enough room for a separate container for each color. There is also a download here on rebrickable where you can download all parts from a specific color in 1 download-file. Wanted to show of the end result. It's been a tiring job, but I'm pleased with the result. 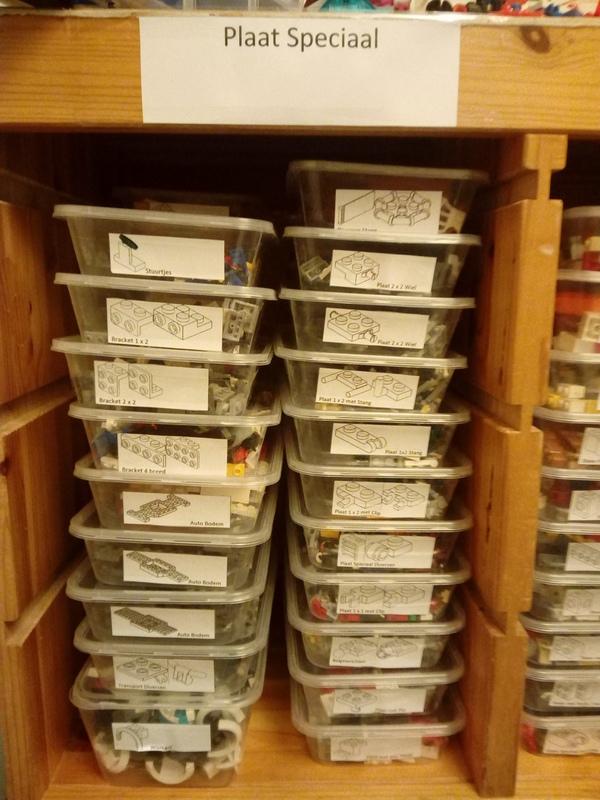 Now to see how long it stays organized with 3 little children in the house (and it is their LEGO). Very impressive! I really like that you put Dutch descriptions on each of the stickers! Those were not in the download above, were they?